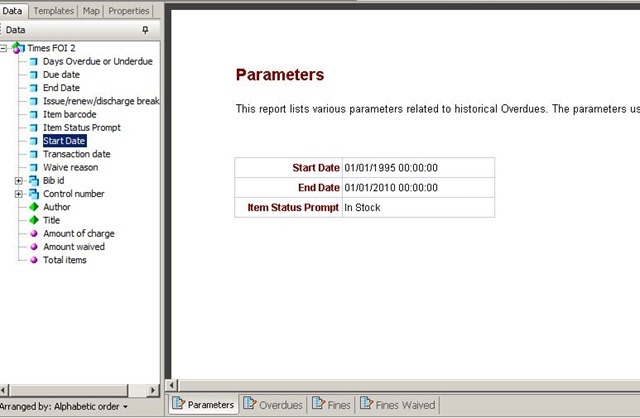 Last week I was looking at a Talis Decisions report problem: some results were returned but they were wildly inaccurate. 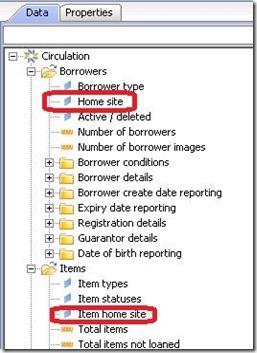 In the end it turned out to be a fairly simple issue: the wrong object had been used in the report: "Home Site" (i.e. 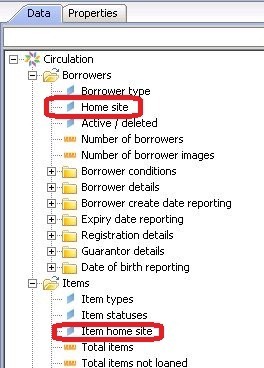 the borrower’s home site) was being used instead of "Item Home Site". This kind of mistake is easy to make: clearly every object has to have a unique name so occasionally object names have to be chosen to be unique rather than purely for clarity in the context. 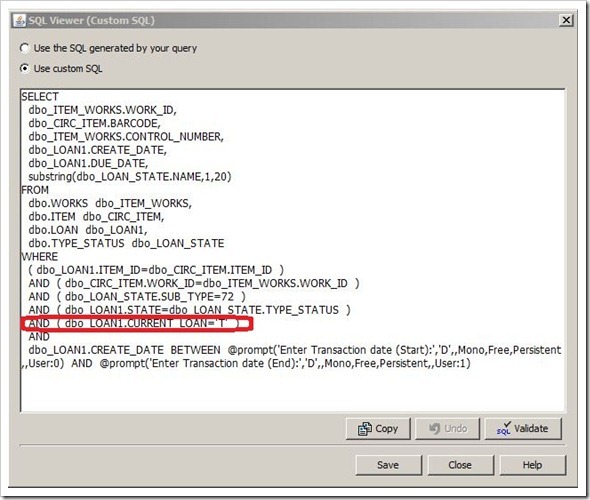 Also if later on experience suggests an improvement in naming, this is difficult to do because changing the name of an object breaks all the reports that use it. 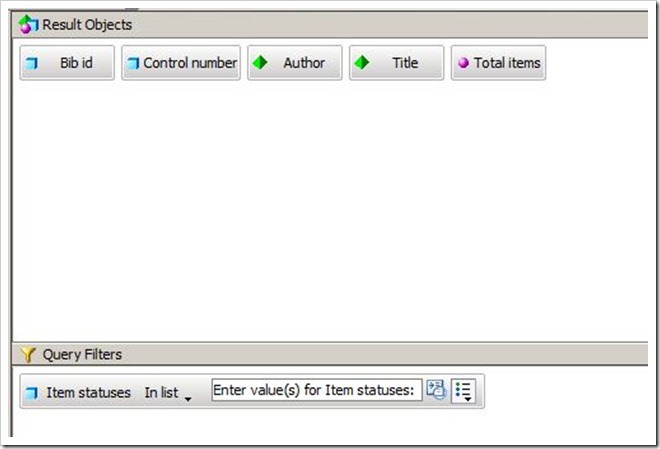 Every object does however have pop-up help associated with it (just hover over the object), so if you get odd results from a query one of the first things to check is the pop-up help just to make sure that you have the right objects. 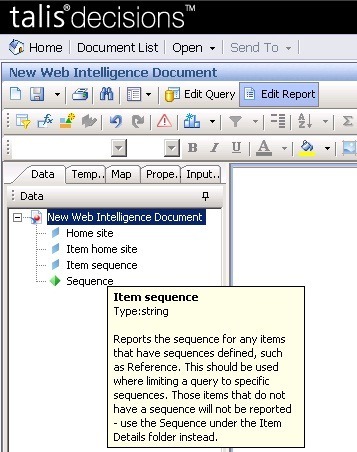 There are also situations where what really is the same thing pops up in two places: an example is Item sequence and Sequence Where this occurs, the difference is often between whether the results are inclusive or exclusive (i.e. 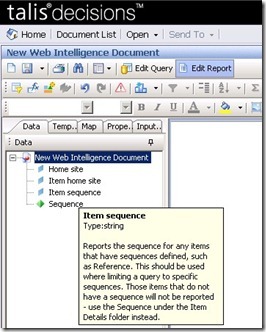 all items, with Sequence if they have one; or just those items that have a Sequence). 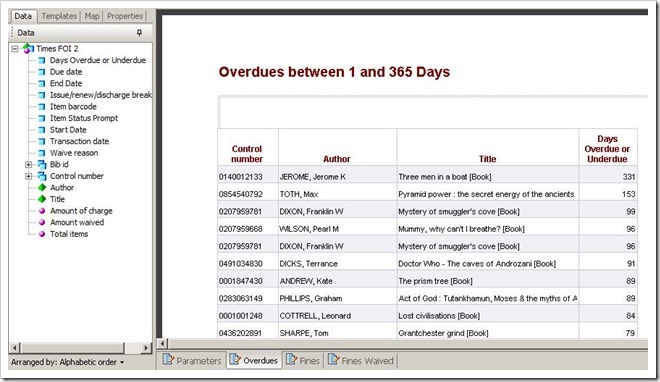 This issue is covered further on the Exploring the Talis Decisions Universes webinar. The real test of the usefulness of Management Information is the action you can take on the basis of it, or what learning you take from it that in turn may lead to action. A customer (Queen’s University Belfast) recently ran a student survey at one of their libraries and on the basis of this re-located some self-service terminals. 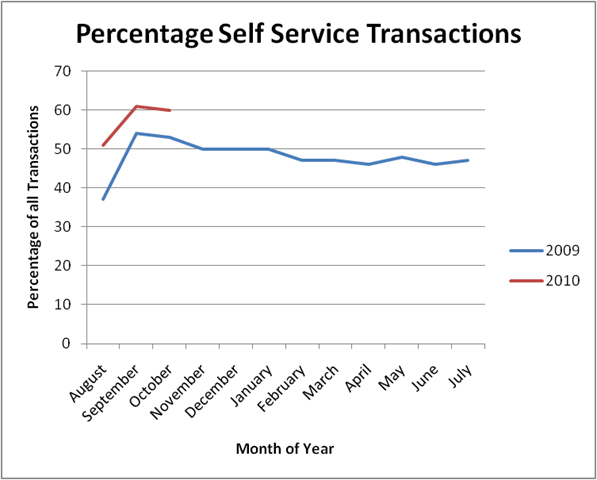 This was the impact of the change on self-service terminal usage (note that figures for July 2009 are interpolated). Surveys are a form of Management information, and this one didn’t just produce “Fancy that” information. It produced results that could be (and in this case, were) put into action. The subsequent monitoring of results closed the loop. 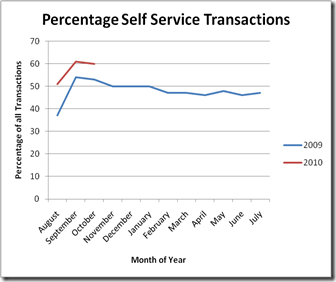 If (in the absence of any other change) transactions had fallen rather than climbed, the terminals could have been moved again either to somewhere else or even back to their previous locations. This was an example of good practice, but there are far too many examples of wasted effort in the Management Information world. Information is expensive to collect, collate, present and (an often overlooked point), expensive to absorb. You can waste end-users time (and therefore by implication, the institution’s money) by sending them heaps of data that they can neither learn from, nor take action on. Furthermore, a mass of information presented in different reports at different intervals can hide the important stuff as surely as a forest can hide a leaf or a blizzard a snowflake. 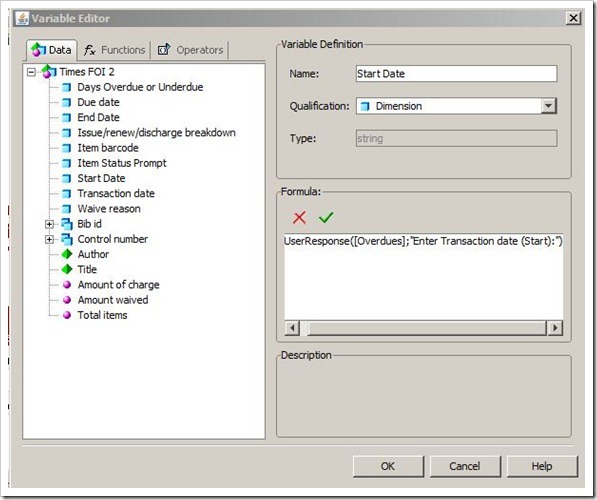 Before you specify a report or decide on a data-collection exercise, it is always worth pondering what actions are available to you when you get the output. How should permanently lost items be accounted for? Without some thought here, the statistics are likely to reflect items most commonly lost or stolen rather than those which are eventually returned. Should all types of Loan and all types of Item be included? What about home delivery, books on prescription and all those edge cases? 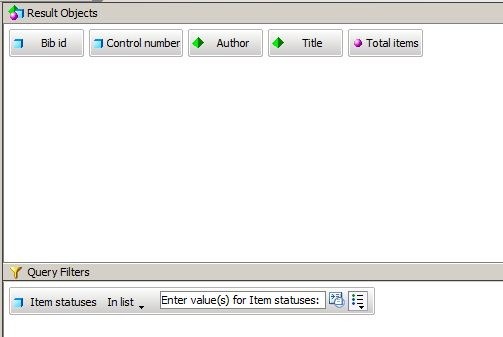 The list is limited by Item Status as a prompt, in part to reduce query execution time by (for example) excluding redundant items. 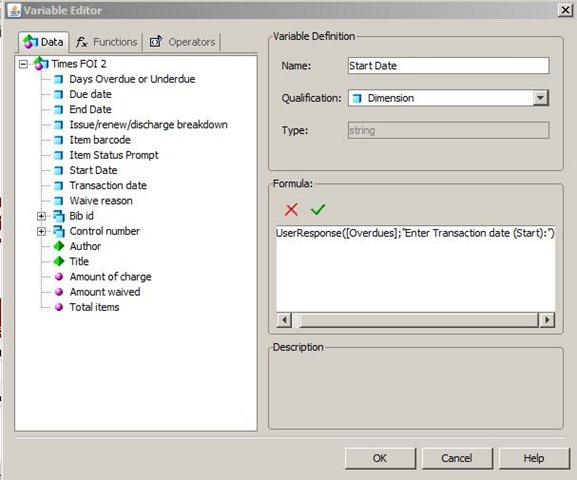 Note the prompt limits on Transaction date. 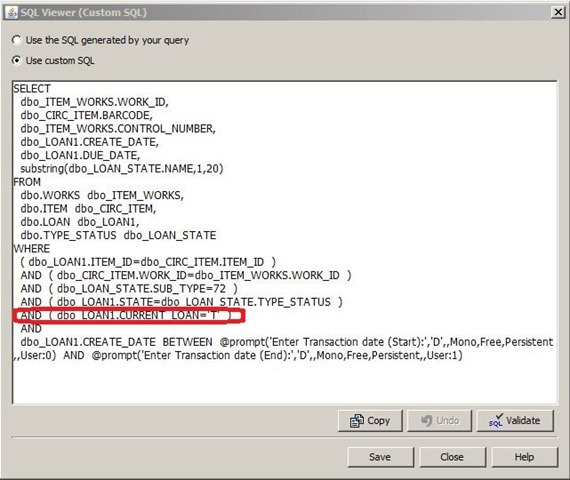 Without limits on the date range, this query could run for a very long time. 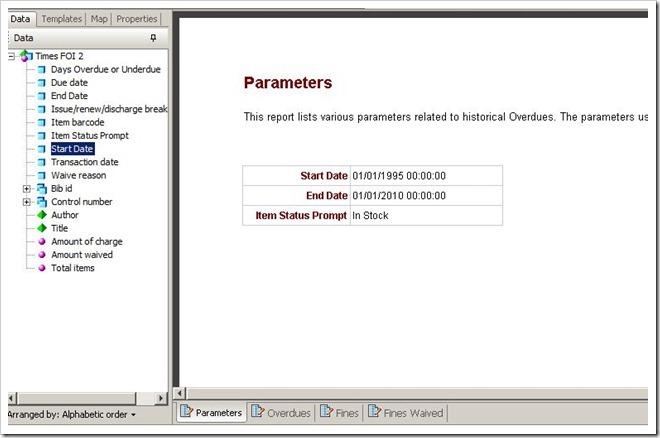 A further filter could be used to bring back only discharge transactions. 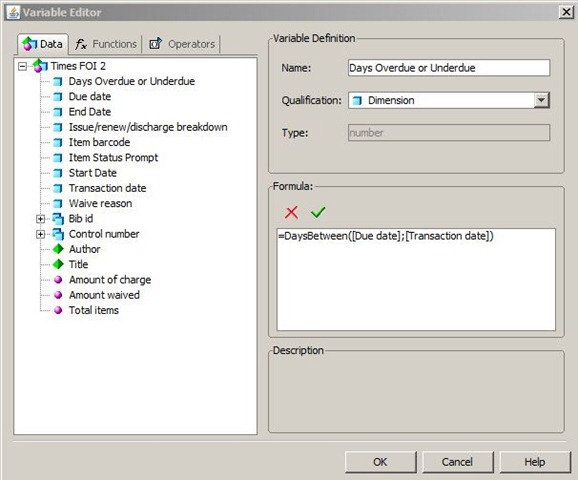 The Formula used is: =DaysBetween([Due date];[Transaction date]). 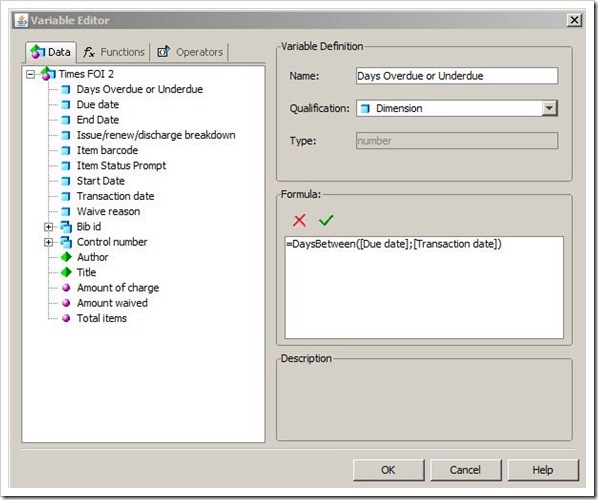 This calculates the number of days between the due date and transaction date for each item. 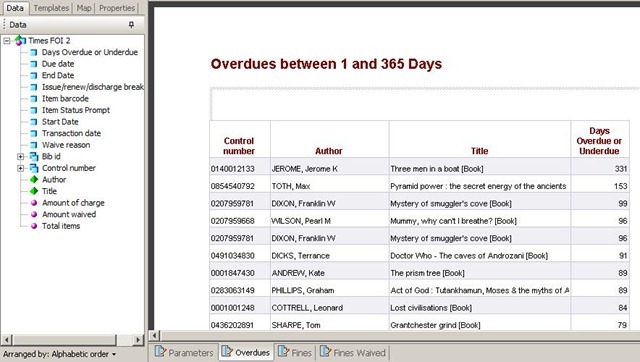 You can use a Report filter (as opposed to a Query filter) to restrict the Days Overdue or Underdue to a range (say 1 – 365) to filter out those where the item has been returned before the due date and also those that will almost certainly never be returned. If this has been helpful, please email me directly, or comment below. If you would like a BIAR file containing an example report, please email me.